Software can greatly aid the user in optimizing the performance of a Windows operating system. While Windows comes with a set of tools that cover the basics, it misses an all-in-one tool and better performance guidelines. Windows users have to start individual tools like services.msc, msconfig or the uninstallation applet of the Windows Control Panel. It is easy to forget to use one of those tools. Even if you know all of them, you are still left with the optimization decision. Should you remove that program from the startup, or should it stay there? Experienced computer users may be able to answer those questions, but what about the regular user? Enter SlimComputer, a free program that aids everyone in improving the performance of the Windows operating system. The program concentrates on removing software and disabling services to improve performance. Software in this regard includes trials and toolbars among others. The program displays its main screen on startup. Here you can select the items that you want scanned on your computer. All are pre-selected by default and all you need to do is to click on the Run Scan button to scan the PC. The results are displayed in a tabbed interface. 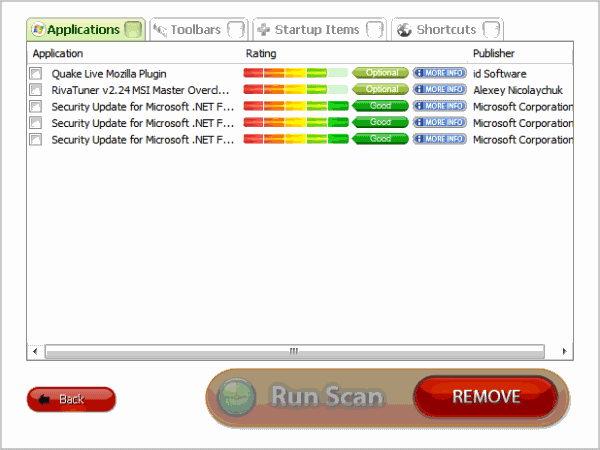 Available for selection are Applications, Toolbars, Startup Items and Shortcuts, but only if items have been found during the scan that may be removed. It is here that users come into contact with the program's rating system. All users are allowed to rate programs on their computers. These ratings are accumulated and used in the program's scan of the computer. Ratings range from unwanted (red) to good (green). This plays right into the scanner threshold that users need to configure on first startup. It is always possible to change the threshold in the settings. Applications, toolbars, startup items and shortcuts can be selected for removal. This triggers the default Windows uninstaller in the case of installed software. 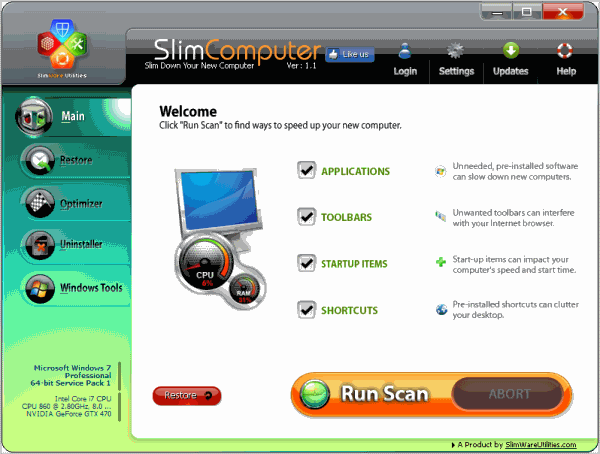 SlimComputer creates restore points for uninstalled programs and changes that are made to the system so that they can be restored at a later point in time. The program displayed three Security Updates for Microsoft .NET under Applications which should not be removed, obviously. Not sure if it is an oversight or one of the negative sides of a user based rating system. The second feature of the program is its Optimizer. It uses the same rating system for all startup items so that it is relatively easy to optimize Windows based on the suggestions. It is still necessary to look at each item before it is removed, considering that what others may not want in their startup may be what you need after system start. Services, strangely, are not making use of ratings. Two buttons are provided in the menu to restore the original settings and to super charge the services. There is no information on screen that explains what super charging the services does. It is likely that it will disable services that are not needed by the majority of users. A third button is available to undo the optimizations. The third feature is an uninstaller. It taps into the standard Windows Uninstaller but displays ratings for all items on screen, which can be very helpful for users to determine if an application is unwanted by the majority of users. All items have a more info button next to them which displays an items popularity, ratings in detail, description, comments and company or developer. These more info links are available in all listings. There is also a Windows Tools section that links directly to Windows system tools like System Restore, Security, Hard Disk Manager or the Registry Editor. It is possible to add a public VirusTotal API key to the program which then enables a virus scanning feature. SlimComputer's biggest advantage is the rating system which aids users in the decision making process. It is on the other hand not enough to rely on that solely, considering that it is user based and may offer suggestions that are erroneous at worst. The PC optimizer is compatible with all 32-bit and 64-bit editions of the Windows operating system. Additional information and downloads are offered at the developer website. The program is developed by the same company that has created the driver updater Slimdrivers and the PC maintenance software SlimCleaner. Another scamware software. No software can optimize the performance of a Windows operating system. I do not think that this program can really optimize the performance of Windows. At the most, it may disable some services or startup programs, but that doesn’t really speed up or optimize the operating system. Services infact use only very minimal system resources, and some of them if disabled could stop the functioning of some key programs. For experienced users, this wouldn’t be a problem but for novice users, it can be a bit of a head ache to sort out what went wrong. These performance enhancement softwares talk a lot, but really does anything. And if at all they do, it will be very negligible and you won’t really notice it.